After a long investigation the guard garrisoned in the crypts seem to head back to the School of Necromancy. An updated notice on the board reads that patrols have been temporarily doubled and those who dare venture in the crypts exercise caution more caution than normal if they do not wish to join the ranks within. A new notice is pinned to the bulletin board in central S'shamath, offering an unusual merchandise. "A huge package of medical equipment useful for specialist Guilds, traders and other buyers is for sale in the Gloura's Wings. Look for the one called Sillamael." "Seek out new ways to avoid stagnation. Create wonders of beauty and art so that all can enjoy it and learn more." The next cycle, a mixed group of orc, bugbear and duergar servants has collected the medical supplies from Gloura's Wings tavern. It is rumored that the packages were purchased by Darkwoods Syndicate for purposes unknown. A drowby approaches the board in mage's robes, her features covered by a mask and hood. Her body is heavily perfumed by a nauseating concoction. Her strides are stiff but purposeful. This one never speaks - she only writes and signs. The pitch black script on the particular piece of parchment shr pinned to the board is angular but still legible. I am no priest of the Masked Lord or one of his clergy. However, brothers and sisters Lolth would have you be her cattle - her meat. Does that sound like the fate of a proud race? One of the drow, a race so feared that Corellon himself needed to act to quell our march to power? We will not bow and scrape and cower at the eight legs of Lolth the Betrayer! Lolth the Deceiver! We will not fear to use Lolth's accursed name for father Vhaeraun is with us! He will guide and protect us! All we need to do is spit in the many eyes of Lolth! Be proud! Be drow! Be free of fear and sacrifice to a gluttonous spider that has done NOTHING but bring ruin to a race that deserves greatness! Even still, brothers and sisters, hide and wait. Let them taste that fear they say is more powerful than respect: the fear of not knowing who is who." 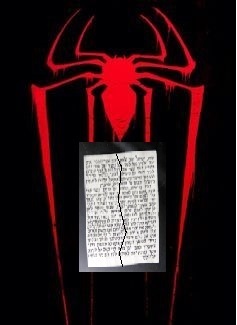 The parchment was ripped and spit upon the same day it was put up. Now, another parchment covers it. "To follow that bloated pustule of a spider, Lolth, is to deny our heritage as a proud race. Lolth tells you lies, brothers and sisters. She told you that males are inferior to females, and that is simply how things should be. She tells you that we need her and that we are nothing absent her predation. Her lies poison our race; male or female, we are nothing but meat to that eight-legged wench. However, we have one deity that loves the drow and believes that ours is a race of boundless potential: Vhaeraun. Do you stand with the spider that treats us as prey, or do you stand with the drow?" Clearly, the author of this religiously charged piece is relentless and either brave or extremely stupid. "Brothers and sisters, Lolth does not hate you. She does not love you either. The Illythiri are her livestock; the caverns of the Underdarm are her farms while her reviling houses are her cages! The nobles of these houses are fattened in these confines - weak and slovenly, unwilling or unable to accept change and awaiting slaughter. Is it any wonder why she prefers noble flesh in her sacrifices? Those outside of her 'noble web' are starved! They provide meager sustenance in the form of their souls, but souls nonetheless they are. It was Lolth who damned us to this and keeps us in this cycle. Even now, her agents think they can silence the truth! Gaze upon the remains of past writings, torn apart by these savage 'dhaerow!' Their goddess has made them so barbaric that they fight with meaningless symbols in an attempt to threaten and silence us! My siblings, show Lolth and her agents that you are more than rothe! Show them that you are illythiri and that you will not stand for being taken as less! And there is the third. Tedia Mori'hyanda approaches the board from the shadows with a note of her own which she hangs on the board with a dagger, stabbing the note above. For those of dos who bother reading these notes of heresy, I wish to remind dos of a part of the history of this city that the faern and those of the cowards of Vhaeraun seem to forget. It was not all that long ago that this city was ready to meet its demise at the hands of a great foe. It was Lolth herself! who saved this city from certain doom by sending one of her own avatars to obliterate those attacking! 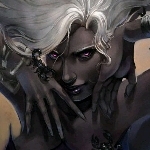 We all know for fact that Lolth desires to make her people strong! To make them the most powerful and feared of all the other races in all Faerun! She does this by culling the weak ... those who whimper and hide away from the harshness of life! Where Lolth rules none dare to walk without fear of her greatness! Now, I am nau Yath'rin, but, even I know that it is better to walk proudly among the the powerful then to hide behind a god whose followers are too afraid to let anyone know who they are! Why Lolth saved this city, I will never know, but I do naut question her, I accept what it is she desires to do. It is better to walk proudly among those who know what it is to rule, then to cower .. hiding away beneath wards of a city that seems to -want- the people within to become dependent on -their- false power. They know they can rule the weak and helpless. There will come a cycle when those beneath them will become too numerous to protect! There will come a cycle when even they will have to choose to follow the ways of Lolth .. even if naut using her name ... or perish under an overwhelming multitude of weak, pitiful, helpless victims of their own pride! Maybe this is why Lolth saved this city ... maybe she -wants- her people to witness first hand what it means to be dependent on those too arrogant to bow to her will. Maybe she -wants- this weak and pitiful place to bury itself from within ... without the aid of enemies from without. The rule book is called Tyegoam a Drow Game and is available for purchase from the librarian in Sshamath marketplace. It's pretty easy to play with in game, hope some of you are able to try it! A few around the Bazar whiteness a thin male Drow in black robes and a black hood that many will recognize as Then Necromancer Nym by the markings of the School of Necromancy on his robes remove all of the religious writings from the board. He crumples the parchments up and one by one burns them to ash by holding them in his right hand and releasing black and red energy that consumes them with the exception of the note left by Tedia Mori'yhanda. The hooded figure folds his note up and places it in a pocket in his robes. He shakes his head for a moment and then leaves the board clean again of the rhetoric. By tis point the common sight of a tailed tiefling grey skinned with the noticeable ram like horns is seen moving between the city and the outer passages alone. For long marks at a time she would then return a little worse for wear and the faint scent of blood. 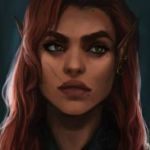 Sh doesn't really catch any one persons attention besides a few side ways glances or simply ignored by the drow or the city. Most dealing with the druger trade merchants selling what little she finds that catch his interest. The Tiefling then heads back out again. The fourth paper has found its way under the board, just under the fourth. Its angular writing is only slightly different, but it still bears the same inflammatory remarks. "Look at them, brothers and sisters. Look at the faithful of Lolth. Look at how they refused to step up to the challenge - the generous invitation - to explain themselves and offer their 'queen' their support! This is because they know the truth is written here! Look at them, not even defending their predation upon the illythiri when it is brought into question! They know this and are therefore INCAPABLE of producing even a NOTE or STATEMENT! They are not illythiri! They are dhaerow! They are darthiir! They are traitors for their crimes against our people! They know this, brothers and sisters, and that is why they are silent but still expect your mindless obedience!